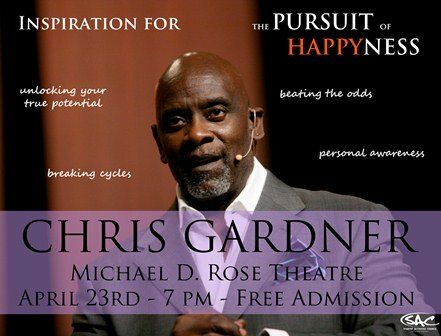 Few stories are as inspiring and moving as Chris Gardner’s rise from homelessness to become the owner and CEO of Gardner Rich LLC, the bestselling author of the autobiography The Pursuit of Happyness, and inspiration for the movie of the same name starring Will Smith in the role of Chris Gardner. Surmounting acute obstacles throughout his life, Gardner shares with his audiences the keys to self-empowerment, and the message of beating the odds and breaking cycles. Now, his presentation has been enhanced to include much of the pragmatic wisdom featured in his second book Start Where You Are. This event is free to attend. Sign up here.